Sleep occupies one third of our lives and significantly influences the other two thirds. Compared to children and older people, young adults (age 18-30) are an age group that have unique needs and particular vulnerabilities. The current healthcare system is failing to provide age-appropriate care to meet these needs because of the inflexibility of the services, lack of incentives to deliver innovative and more appropriate models of care, insufficient training of healthcare professionals, poor communication across professional boundaries, and patchy implementation of guidance (Goddard, 2015). My focus is on sleep-deprived young adults with a gradual shift to more complicated cognitive and behavioural factors and the professional industry. Sleep problems are challenging as everyone has different lifestyles and sleep patterns – substantial numbers of young adults have an irregular routine and adjust their sleeping hours to varied schedules. Further complicating the picture, it can be confusing for individuals to identify how environmental, behavioural, mental and interpersonal factors affect sleep quality. Sloop addresses this challenge. Sloop alludes to a metaphor of sailing for sound sleep. 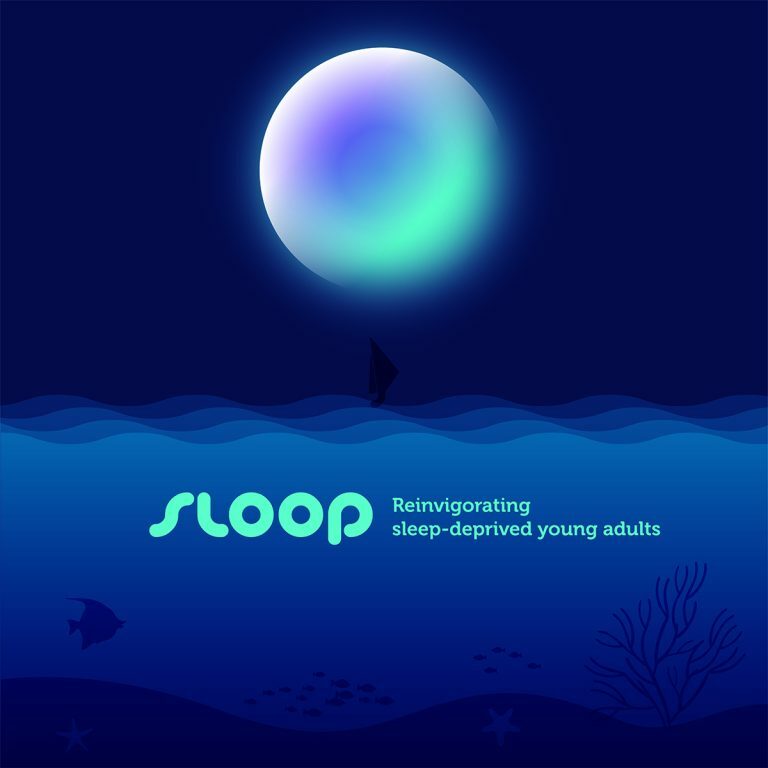 Reinvigorating sleep-deprived young adults, Sloop is a personalised digital service that empowers users to develop a healthy lifestyle through a self-management scheme. Young adults can receive seamless and accessible guidance, tailored to their unique needs via an app and follow-on referral to professionals, if required.